The National Health Insurance Authority (NHIA) completed public consultation the future of NHI on 31st January 2019. The NHIA proposed a Sugary Drink Tax as a potential funding source for some of the costs of expanding NHI. To gauge the opinions of Bahamians regarding a potential Sugary Drink Tax, the NHIA conducted a telephone poll from March 12-21st 2019. The poll has shown that 86% of the population is aware that frequent consumption of soda and other sweetened beverages increases the risk of obesity and other health issues such as diabetes and heart disease. A tax on sugary drinks would increase the cost of drinks such as carbonated soft drinks, juice drinks, sports drinks, flavored and enhanced waters, sweetened teas and energy drinks. Of those polled 56% agreed that a sugary drink tax will change their behavior to drink less sugary beverages. 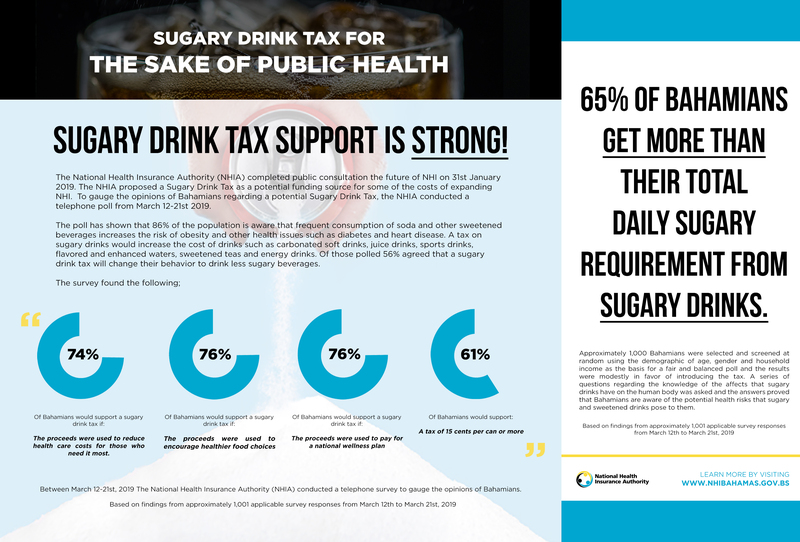 74% of Bahamians would support a sugary drink tax if the proceeds were used to reduce health care costs for those who need it most. “Non-communicable diseases such as diabetes, cardiovascular disease are at epidemic proportions in The Bahamas and rising fast. Today, 79% of the population are overweight. 45% of these individuals are adolescents who are classified as overweight with obesity. The Bahamas is among the most obese countries, ranking at an astonishing 6th place globally. Adopting this policy measure would place The Bahamas amongst other health-conscious and progressive countries that have introduced similar taxes. From March 12-21st, 2019 The National Health Insurance Authority (NHIA) engaged Public Domain to conducted a telephone survey to gauge the opinions of Bahamians on the introduction and implementation of taxation on all sugary and sweetened drinks. Approximately 1,000 Bahamians were selected and screened at random using the demographics of age, gender, and household income. For more information on NHI Bahamas, please visit www.nhibahamas.gov.bs.